Lt. (j.g.) Jerome J. Zumwalt, son of Mr. and Mrs. Jerome H. Zumwalt, attended Frederick High School and SWSTC, Weatherofrd; husband of the former Louise Cooper. 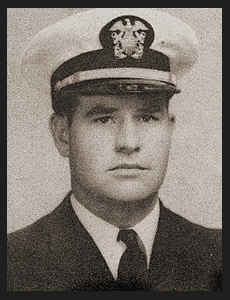 Entered Navy in Feb., 1942, trained in San Diego, Cal., Tucson, Ariz., Ft. Schuyler, N.Y.; served in the Hawaiians, French Frigate, the Johnstons, the Admiralities, the Carolines, the Marshalls, Palau, the Marianas. Awarded Asiatic Pacific Ribbon, Good Conduct Medal, Am. Defense Ribbon.